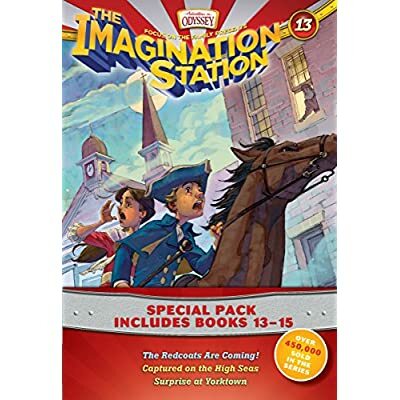 When they step into the Imagination Station, kids experience an unforgettable journey filled with action-packed adventure to inspire their imaginations. With each book, they’re whisked away with cousins Patrick and Beth to embark on a new journey around the world and back in time.This 3-pack of books 13–15 includes the following: The Redcoats Are Coming!, Captured on the High Seas, and Surprise at Yorktown.#13 The Recoats Are Coming!The first of a three-book story arc about the American Revolution, The Redcoats Are Coming follows Patrick and Beth as they assist the revolutionaries by waking up the sleeping citizens of 1775 Concord before the Redcoats come. In this adventure, the cousins meet Paul Revere, Samuel Adams, and John Hancock. They help smuggle musket balls, sound the alarm that the Redcoats are coming, and deliver a secret message to Paul Revere. Along the way they learn that most of the revolutionaries leaned on God’s direction and even pastors helped in the cause.#14 Captured on the High SeasBritish warships battle with American privateers in this high sea adventure. Cousins Patrick and Beth have landed on the Royal Louis in the middle of the Revolutionary War. Cannonballs fly and swords slash. They’re captured! Now they face even more dangers. Will their new friend James Forten be sold by the British into the West Indies slave trade? Or will they all be sentenced to the overcrowded prison ship floating near shore where scores of prisoners die from filth and disease? Patrick and Beth help plan a daring escape as they witness firsthand the deeds of brave heroes who fought to make America the land of the free.#15 Surprise at YorktownTravel two centuries back in time to the final battle of the American Revolution at Yorktown, Virginia. Cousins Patrick and Beth sneak through trenches and race across battlefields to warn General George Washington about a dangerous spy. The spy is stealing his secret plans and giving them to the British. Cannons roar and the ground shakes as the struggle reaches a climax. Washington’s ragtag soldiers are up against the most powerful army in the world. Will Patrick and Beth witness the American Revolution come to an end? Or will they be caught in a dangerous trap they can’t escape?